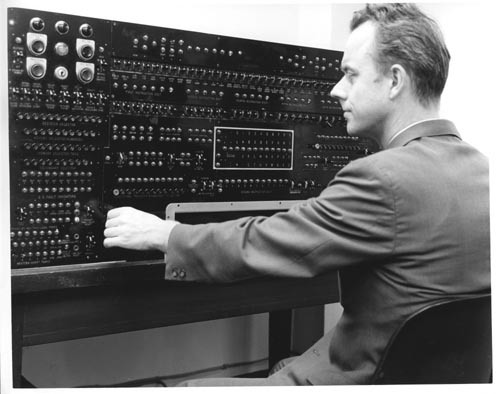 Black and white image of man seated at UNIVAC I control panel. His left hand is on a panel switch. Verso: Attached paper label "Although it's not an example of post impressionistic painting of modern sculpture, this UNIVAC-1 control panel is being auctioned off as a collector's piece by Parke-Bernet Galleries, Inc. of New Your City. The panel, which is being examined by Svend E. Hartmann, vice-president of Time Brokers, Inc. , will be sold as part of the fine arts auction house's July 30th computer sale. The Univac 1 was the first commercial computer ever to be installed."